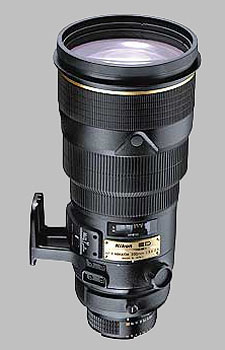 (From Nikon lens literature) Super fast, super quiet lens using Nikon's Silent Wave motor technology. Compact super-telephoto lens that is ideal for photojournalism, sports, and nature photography. M/A switch for fast transitions from AF to manual focus. I bought my copy of this lens used in February 2009. I have shot around 25,000 photos with it since that time. I use it with a D700. I have TC14E and TC20E II teleconverters as well as a C-PL1L circular polarizer that I use with this lens. This is a brilliant lens. This is a big heavy lens. I mostly shoot motorsports, and I normally shoot with the lens on a monopod. It is capable of producing stunning images. It works very well with the TC14E, and reasonably well with the TC20E II. I have had less success with the lens mounted in a tripod (Arca-Swiss B1 ballhead and Gitzo Mountaineer legs using a RRS foot) at slower shutter speeds (> 1/100). The tripod collar may be partly to blame, but at this point I am more inclined to blame my technique. Additional practice should let me refine that opinion. As we speak, B&H advertises the Nikon at USD5200 and the Canon at USD 4500. Although there's such a high price premium over the Canon, the Nikon offers practically nothing extra over the much older Canon, apart from slightly better IS. Crisp focus, quite, f2.8 and great bokeh. I recently rented this lens for a concert at my church. We have some poor lighting and I wondered how the lens would perform. Turns out the lens performed as I expected. Got lots of nice crisp shots from various angles. Moving around in a dark auditorium was a tad awkward, though. A couple days later I set up my camera on a tripod in a busy atrium/foyer area and got some outstanding candids with natural light coming through translucent skylights. If I had the dough I'd get one for me. Very good lens. The newspaper I work for has a handful of these for their D2h bodies and after using it to shoot speeches, sports, and other media events I've been pretty happy. Coming from the Canon camp and shooting both this was a comfortable lens to use and the focus was pretty accurate.